In just a matter of weeks. Samsung is supposed to launch its Galaxy S10 lineup. But It seems like, the Company has a few more products to showcase at the event. Soon after the Galaxy Sport watch renders the new Samsung wireless earbuds called Galaxy Buds. 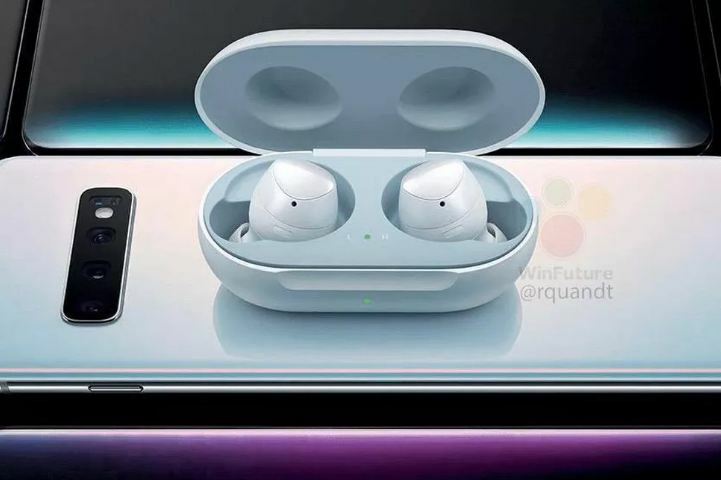 The image of Galaxy earbuds was posted by WinFuture. The Case of S10 got more real today with an official-looking photo showing off the ‘Galaxy buds’, true wireless earbuds. In the image, earbuds inside a compact charging case are shown on the top of what looks like S10 handset (as per early rumors). S10 will also be able to charge other devices using a technology called PowerShare. So, It cannot be a mere coincidence. Just like Huawei Mate 20 Pro charges its Freebuds 2 Pro (wireless earphones), S10 will charge the upcoming Samsung Galaxy Buds. Is Samsung Planning To Add A New Line Of Wireless Headphones With Galaxy Earbuds? For now, there is not much information about Samsung’s upcoming true wireless earbuds. So it’s not clear if the Company would introduce a new line up. Since it is not the first wireless earphone pair, it will not be surprising if it comes out to be an update of Samsung Gear IconX headphones. As per the reports, Smasung is likely to launch upcoming truely wireless earbuds at a price of $170 (Rs 12,000 roughly).